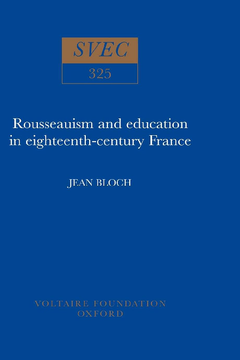 This volume examines the evolving reputation of Rousseau as an authority on education in France from the publication of Emile in 1762 to the fall of the Jacobins in 1794. It takes as its focus the centrality of the debate over private and public education. The author argues that what unites Rousseau and the Revolutionaries is their holistic approach, which perceives an organic relationship between the internal constitution of the person as a moral and emotional being and what are normally thought of as external public matters such as politics. Education is, in fact, the key to Rousseau’s philosophy and it is also the key to revolutionary change. The Revolutionaries may start by looking at the necessary reform of the monarchy or the taxation system, but as things develop, they realise that if the Revolution is to last, education must be appropriate to it. In this way the Revolutionaries are obliged to consider education as a tool for thinking about the very problem Rousseau had perceived: the connection between the inner self and society and its institutions. The study examines the way in which the early revolutionaries are faced by Rousseau’s already established reputation as an authority on private education and how this poses problems for them. Linked too emphatically with individualism and the private sphere, Rousseau represents an ambiguous symbol for those concerned with the reform of public education. Yet, his reputation in the field of child care the developing cult of him as inspiration and symbol of the Revolution make him an almost obligatory reference point for educational reformers. The author’s analysis traces the progression of the Revolutionaries’ attitudes. The volume demonstrates how the first thirty to thirty-five years of the fortunes of Rousseau’s reputation as an educationist have, arguably, more to do with politics than pedagogy. Two major phases of the intermeshing of education and politics around the figure of Rousseau can be seen: the first in the years following the publication of Emile, when the supporters of absolute monarchy show their suspicion of the radical implications of Emile, and the second in mid-Revolution, when the association of Rousseau and his political doctrine spills over into the plans of educational reform. This volume charts the progress of these developments and casts new light on the vexed question of the relationship of Rousseau to the French Revolution. 1 . Private or public education?